I love the fact that you can see the insecurity in her eyes even now. a) fundrasiing for solution/programme development and implementation? ( Celebs include royalty for convenience) Where does the majority of the funding come from for example, programmes you are currently involved in? Does the value of a cdlebrity endorsement/support lie in face recognition/ networks? Face recognition would help with raising funds from Joe public, yes/no? Networks are where the single big donors would arise from yes/no? Solution adoption could only be assisted by celebrity involvement if the celebs had some legitimacy, yes/no? Are there more efficient ways to raise funding/awareness than celebirty endorsements or patronages? - Celebs are never needed for solution adoption, it's done by senior folks - with at least P-4 level as it depends on so many factors that only insiders may know. Maxima may be an exception due to her work experience, but again she may only voice her opinion. - UNDP, UNAIDS, UNESCO, and others work with money from nation states/governments and/or by cooperating with donors such as the World Bank, IMF, USAID. That's the type of funding used on the projects I've worked. Never through fundraising from the public or through celebs/royals. Nation states pay their regular part based on many factors (GDP, economic strength, etc) and in addition may give financial support to particular projects because of policies/threats in their own countries. Donors again come not because of celebs/royals but because of their own programs - it is beneficial to partner for many operational reasons. - Nation states adopt UN frameworks not because of celebs but because it is UN people who come and talk to governments there, not people like Mary. - I unfortunately can't comment on efficiency of different ways of fundraising or raising awareness as my field doesn't need that: we get stable funding from a few western governments and some big donors, and the topic is something that is important but doesn't require the public to contribute in any way, if that makes sense. - One of the things UN is doing is changing attitudes/behaviors so this is where celebs may step in - gender equality, LGBTQ rights, refugees, for example - this is where the public in many places needs to change how they treat certain groups of people so having someone famous on board may be good for that. But Emma Watson or Jolie may be them, not Mary or Sofia or MM in the future. 1. Our natural receptiveness to virtue signalling is only countered by the discomfort of cognitive dissonance. 2. We actually believe that the end justifies the means. Perceived achievement is lauded above honest effort. 4. We believe in hierarchies and deep down that the person at the top must have succeeded at some game we have not figured out how to play (which actually seems necessary for survival) however we might detest their values. ( I think all of the above are related). Out of interest, here is a link to an article by the person who coined the phrase “virtue signalling”, James Bartholomew. "The phrase came to me after years of trying to come up with the something. Researching my previous book, The Welfare State We’re In, I came to realise that the Victorians and Edwardians gave vastly more money to charity than people do now. It was normal even for the working and artisan classes to give as much as 10 per cent of their income. That compares with donations of less than 1 per cent for the general population now. Among many other things, they gave money to help charitable hospitals through the King’s Fund in Saturday workplace collections. They also took it as normal to look after their aged parents and other relatives. 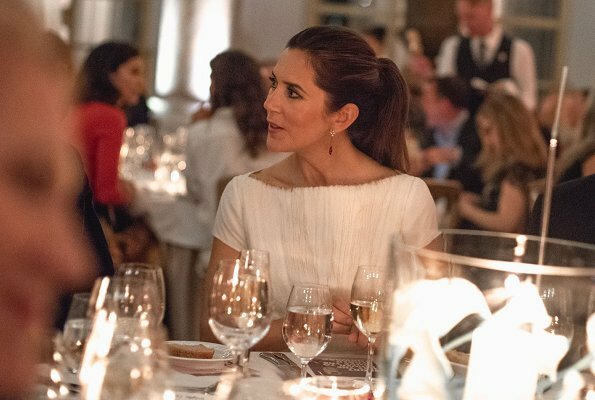 Crown Princess Mary was a guest of honor when there was a delicious dinner event with an international guest list at the hotel d'Angleterre in connection with the Copenhagen Fashion Summit fashion conference. The Crown Princess made a nice entrance to the hotel at Kongens Nytorv in Copenhagen. Mary attracted legitimate attention in her amazing white dress. 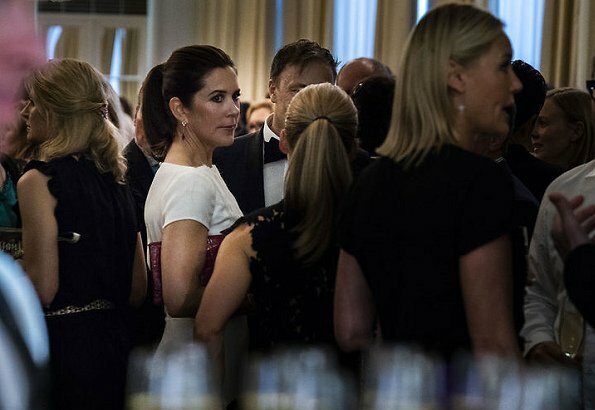 Just before the arrival of the Crown Princess, the Danish star actor Connie Nielsen made his entrance to the fashion party at the hotel. Can you or someone else from Danmark, tell me how is MEDiana's Danglish? Is it as bad as it sounds to my ears? Nice dress, shame about the bouf hair and massive earrings ruining focus the dress detail should have got and making it look like a mess. Not the best pic of her : fake smile not reaching her eyes and severe hairdo making her looking older. As the protector of the Copenhagen Fashion Summit, Yrma participated in the official opening of the Copenhagen Fashion Summit in the DR Concert Hall in Copenhagen. She was received by the CEO at Copenhagen Fashion Summit Eva Kruse on arrival. PeDe. Mares may have copied someone else's style but wow! she looks good! She looks good indeed in that white blouse and green skirt, but the outfit before with the black blouse, white skirt and blue accessories has to be my favorite! To say she has hours of private tuition it's not great. Congratulations to all the winners. You have researched, brainstormed, discussed and worked hard. It is clear to see in your newspapers and news sites. The theme "Love yourself - body and ideals" have you changed and you have written about many more different topics than I imagined.
" Today, there are too many who walk around with a lump in their stomach and feel they do not really fit into their self-written norms. Social media is a good example of this. It affects the humanity of how to look. Especially the young people think it's a leak for the perfect body and the perfect way to strive for themselves. These are the inner values ​​that count, but often there are many who forget. We all have a responsibility and a duty to treat each other with respect and care, even if you do not look or do like the others. "One always lives in someone's lives in his hands," is an existential thought, according to philosopher KE Løgstrup. We will always carry some of our fellow human lives in our hands. No matter if we do a little thing, it will put a touch or impression on the person's life . " The lead writer is based on the inner turmoil. The lump in the stomach, which we all know and have experienced. The uncertainty that may arise with the question: "What do the others think about me?" The uncertainty that we may not dare to show who we really are. Or do the things we want most. We may be afraid to pop out, be wrong - that we are not good enough if we are just ourselves. We know that every fifth young person has difficulty talking to his friends about what really botheres him or her. If you do not feel that you can tell how you actually do, or show who you are in, you can easily feel very lonely. In this way ideals of the perfect can stand in the way of feeling part of the community. Ideas are created to inspire - not to prevent anyone from being himself. And it should not require so much to dare to be self. In the Mary Foundation we have chosen to be part of the Media Competition 2018 and contribute with our experience in the development of the materials because the theme "Love yourself - body and ideals" lies in the natural extension of our work, including bullying and loneliness. We work for everyone to have a right to belong to. And no one should stand alone or feel outside. The leader in the 7th newspaper deals with something central to describing our responsibility to treat each other with respect and care. We are all different. Try looking at your side man. You look different, though you may also look like each other on some points. You may be skilled at different things. You may probably like different things. And you may have different hopes and dreams for the future. We must make space for this diversity because it makes life not only more interesting, but much more valuable. What we all share in common is that we need to be part of a community. We all need to be seen, acknowledged and loved, like those we are. And we need to feel that we contribute to something that is greater than ourselves. You can help each other to be caring, spacious and tolerant - and appreciate each other's differences. So no one needs to spend all his energy. So everyone dares tell others how they actually go and have it. So everyone can meet up in school every day and just be themselves. Thank you for your efforts and inspirational papers.